Scientists get to study meteorites in the laboratory all the time, but its not often that a scientist gets to work on a meteorite after watching that meteorite fall. This happened to Marc Fries of the Planetary Science Institute, who is performing laboratory analysis of meteorites from April's Sutter's Mill, Calif. meteorite fall. But there's a twist - Fries didn't see the meteorite fall with his own eyes, but rather was the first person to "see" the fall by looking through imagery from weather radars. Since finding the Sutter's Mill fall, Fries and his colleagues Robert Matson, Jake Schaefer and his meteorologist brother Jeff Fries have found three more confirmed meteorite falls in the United States in only eight months. The quick recovery and resulting findings are described in a Science paper published today titled "Radar enabled recovery of Sutter's Mill, a unique carbonaceous chondrite regolith breccia" on which Fries is a co-author. The Sutter's Mill meteorite fall occurred just before 8 a.m. April 22 as an uncommon daytime fireball. The fireball passed south of Reno, Nev., headed west and was seen across Nevada and California. Residents around Coloma, Calif. reported hearing a "scary" loud sonic boom that shook their houses. These are signatures of a meteorite fall, and there was immediate interest in finding the site where any meteorites would have landed. Traditional meteorite recovery based on eyewitness accounts, however, is a tedious and uncertain process. The American Meteor Society estimates that one meteorite fall occurs every day somewhere on Earth, and yet the Meteoritical Society typically records only about 10 new meteorite falls worldwide each year. Meteorite falls are fairly common, but meteorite recoveries are a rare event. A new tool is improving those odds. Weather radars operated by the National Weather Service continually scan the skies over the United States, and Fries and his colleagues realized that any meteorites that fall in the U.S. could be detected on radar. Sure enough, weather radars not only recorded the Sutter's Mill fall, but actually presented that data while the fall was still in progress. With radar imagery of the April 22 fall in hand, Fries immediately contacted Petrus Jenniskens of the SETI Institute in Mountain View, Calif. and lead author on the Science paper, and meteorite hunter Robert Ward. Fries directed them to the site of the meteorite fall, where they parked their vehicles. Both men proceeded to find meteorites in the parking lot. After these discoveries, meteorite hunters, scientists from nearby institutes, and curious members of the public descended on the site. To date more than 60 meteorites weighing a total of more than 900 grams - about two pounds - have been recovered. The meteorite, named "Sutter's Mill" after the historical site near where they were found, is a rare carbonaceous chondrite that contains valuable clues to the origin of Earth's water and light organic compounds that may have played a role in the origin of life. The Sutter's Mill meteorite is important to science because it is a leftover product from the same ancient processes that created the Earth and other planets. "This meteorite is about 4.5 billion years old," Fries said. "To put that in perspective, stretch your arms all the way out. Now let's say the distance across the span of your arms is 4.5 billion years. If that were 4.5 billion years, then a single swipe with a nail file across your outermost fingernail would remove all of recorded human history. But the meteorite has witnessed the entire span of time represented by your outstretched arms. It is probably the oldest thing you will ever encounter here on Earth." Fries is now part of a multi-institute consortium investigating the meteorite, and will analyze the structure of carbon in the Sutter's Mill carbonaceous chondrite using a technique called Raman spectroscopy. This technique measures the alteration that this meteorite has experienced in its lifetime, ranging from its initial formation from dust and gas, to accumulation into an asteroid, and finally to the events that created the bright fireball seen April 22 in Nevada and California. The use of weather radars to detect meteorite falls has already dramatically increased the number of meteorites available to science, and to the public. Since Sutter's Mill, the team has located the Battle Mountain, Nev. meteorite fall (5.9 kilograms of meteorites recovered), the Novato, Calif. fall outside San Francisco (approximately 364 grams recovered), and a fall outside of Addison, Ala. that to date has yielded about 90 grams of meteorites. Meteorites are found regularly in deserts around the world, but freshly fallen meteorites like these are especially useful to science because they haven't been altered by the same weather that, ironically, the weather radars were built to detect. 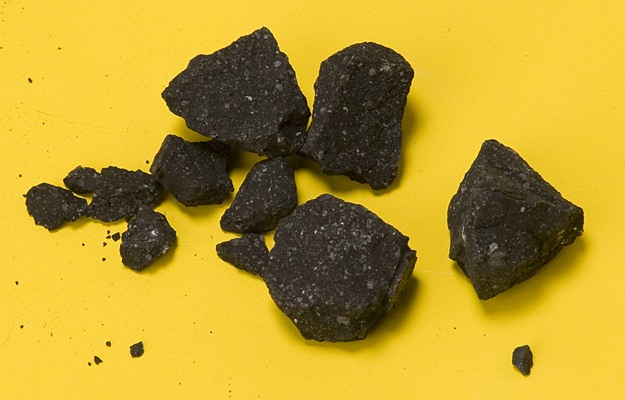 "Rainfall washes away some of the most interesting parts of meteorites. Any very reactive minerals will corrode, like the oldhamite found in Sutter's Mill, and many light organic species like amino acids - important for the study of the early Earth - are simply washed out of the rock," Fries said. "Weather radar detection allows us to not only collect meteorites that would otherwise go undiscovered, but we can get to them rapidly enough to preserve these important compounds. "This is a wonderful adventure," Fries said. "Rob Matson, Jake Schaefer, Jeff Fries and I have been working for years developing the methods for locating meteorite falls using weather radars. To have those efforts come to fruition with a rare type of meteorite fall in the very state where I live is superb. Then, to get to analyze those meteorites in the laboratory - that's just plain fun."